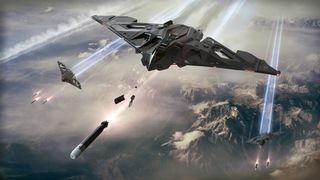 The Aegis Eclipse is a bomber designed to get in and strike before it's ever even spotted. After extensive service with the UEE, this high-tech military equipment is making its debut on the civilian market for 2947. 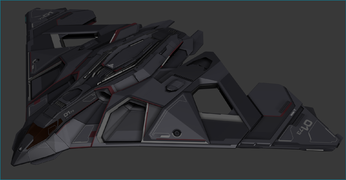 The arrowing design of Eclipse allows the ship to stay stealthy. Inconspicuous twin engines are moulded into the shape of the hull, weapons are stored internally until they’re ready for use. The Wings can be adjusted to space or atmospheric flight to adapt to the environment. During Zero-G space flight, the Eclipse typically adopts the compact wing position in order to create a slightly smaller profile for harder detection. During atmospheric flight, the wings of the Eclipse can fully expand and deploy smaller fins around its body to improve aerodynamics. 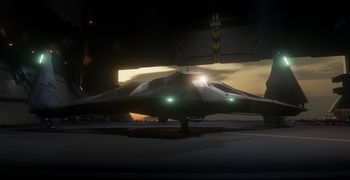 The sole purpose of Eclipse is to be a mid-range stealth bomber, capable of sneaking behind enemy lines and delivering a high damage strike, but it should not stay in combat due to its defensive shortcomings. The ship is designed to approach a target silently, fire its payload, and leave. The Eclipse carries three size 9 torpedoes, and two size 2 ballistic gatling weapons. 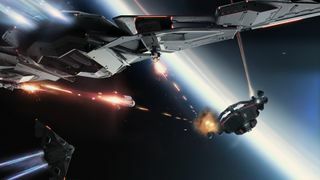 These larger torpedoes take a while to lock on to smaller ships, and combined with its relative lack of agility, that will mean the Eclipse is not recommended to be used in dogfighting. The Eclipse was commissioned under the previous administration on the orders of Imperator Coley. At the time, the administration felt that despite the efforts to mend ties with the Xi’an, the species longer lives resulted in lingering hostilities towards the UEE under the Messer reign. 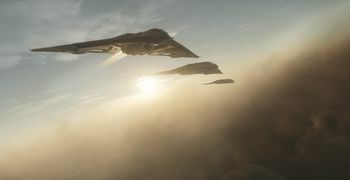 Imperator Coley requested bids for a classified stealth bomber to have as a cautionary defensive measure should another Cold War arise between the Humans and Xi’an. 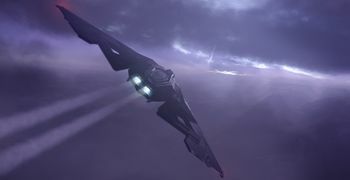 In 2930, the UEE Navy was in need of a more advanced stealth bomber to use specifically in defensive operations against the Vanduul. Military casualties were mounting in cases of direct combat with Vanduul capital ships. The Navy needed a ship that could strike quickly before the enemy detected their presence or soften up strategic targets in anticipation of a larger attack. Aegis Dynamics won that bid. The arrowing design, massive firepower, and cutting-edge clandestine technology of their design easily surpassed the competition. The Eclipse’s advanced hull system is adaptable to environments thanks to multiple wing configurations that adjust to space or atmospheric flight. After 2 years of extensive field tests, the Aegis Eclipse went into service in 2932. 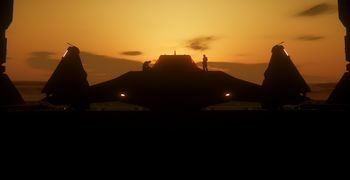 Since its introduction, it has distinguished itself as the most advanced stealth bomber in the UEE arsenal, with over three dozen successful operations. 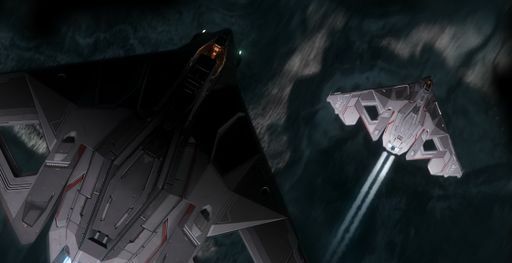 Since its first flight in Operation Lighthammer, the Eclipse has participated in numerous stealth and tactical bombing operations over the years, primarily for defensive measures performed by the UEE Navy. The Eclipse was declassified as a military-level asset in 2947 under Historical Truth Act and the Militia Mobilization Initiative and sold to UEE citizens with a good standing. 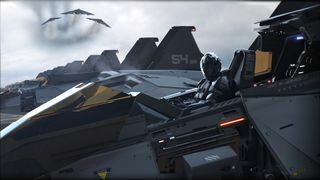 The fund was used to continue funding Project Eclipse for the UEE Military. 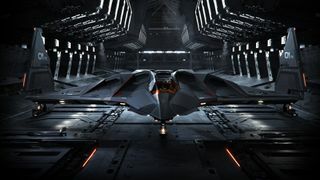 Notwithstanding the declassification of Project Eclipse, the ship embodies proprietary technologies and intellectual property that remain under the ownership of Aegis Dynamics and/or the UEE. 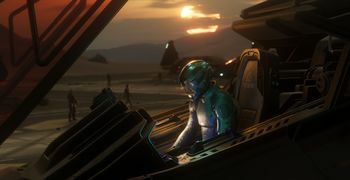 The Eclipse's concept is designed by Gavin Rothery (Freelance Concept Artist) in collaboration with Paul Jones (Art Director) in Foundry 42 UK. 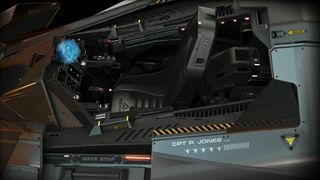 The ship is brought into engine by Joe Neville (Senior Vehicle Artist) in Foundry 42 UK with contributions from Corentin Billemont (Systems Designer). 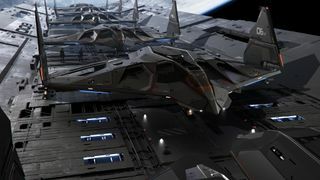 The ship was first revealed in 2017-05-19 in the Aegis Eclipse Concept Sale. 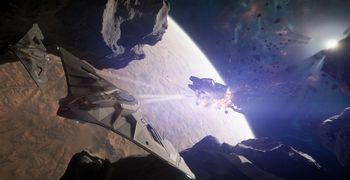 In 2018-06-30, with the release of Star Citizen Alpha 3.2.0, the ship became Flight Ready. 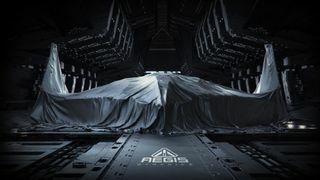 The AEGIS bomber should combine elements of Aegis’srounded aesthetic, and the design elements of iconic stealth ships. Length ~22 meters The ship has been discussed to be approximately the size of a Gladiator. For maximum compatibility it should be able to fit inside an Idris, so should be 25m wide max. Mass 17,000 kg Being an advanced stealth ship, the size and shape of the ship is kept to a smooth, minimalist nature, which will also help keep its weight down a little. Crew 1 This is a single seater bomber. Engine 2 Twin engines, as they would produce less heat together than one larger engine. A central torpedo bay also would restrict the ability for it to have one engine. Thrusters 8 x Joint Thrusters 4 x top, 4 x bottom with two top and bottom on the front, and two top and bottom at the rear. Power Plants 1 x Small The ship was suggested to run with small components, which should help to keep its signature down. Weapon Hardpoints 2 x Size 2 Weapons Ballistic Gatling weapons to be used for short, brutal engagements. However, the Eclipse is not a dogfighter and isn’t armed for protracted engagements. Weapons should fit inside the wings and have flaps open during flight/use. Missile Hardpoints 3 x Size 9 Torpedoes Three size 9 torpedoes are stored inside the ship. A central hatch similar to the Retaliator’s opens for them to be fired. Armour Small As above. However, its armour should have enhanced scanning/detection reducing properties similar to the Hornet Ghost. Cockpit Accessed via ladder on the nose of the ship like the Avenger Warlock. Weapons stored on interior of the wings; do not gimbal. Flaps on wings should open during flight so weapon can be fired. When closed they should blend in with the rest of the ship’s wing profile. Torpedo bay will be housed in the mid/rear of the ship, the underside will open, allowing them to be fired out. Torpedoes will be housed side by side, allowing the ship to maintain a fairly sleek profile. Ship Size Most Stealth ships are considerably wider than they are long. The Eclipse will be able to have a wingspan only slightly longer than its length if it is to fit inside an Idris. 22m x 25m leaves it as long as a Gladiator, and slightly wider. In the initial tease, the Eclipse is covered in a grey tarp known as B419-AR Tactical Stealth Utility Tarp (TSUT. ), which is a classified tarp produced by Crusader Industries. The Eclipse is an extremely specialized vessel, designed to excel at its intended task and role, so no other functionalities are currently planned other than its original role. The Eclipse is heavily influenced by the real life bomber Northrop Grumman B-2 Spirit. For a full gallery, see :Category:Eclipse Images. ↑ Gavin Rothery, David Ladyman and Ben Lesnick, Work in Progress: Eclipse, Jump Point, vol. 5, no. 5, pp. 3-40, 2017-05-19.